While we remain a few days out from our official release day on October 22, the feast of St. John Paul II, two readers have mailed in some early thoughts on Image and Likeness. This is a powerful book. Makes me want to look for more by the contributing authors. I’ll say the same when I do my review. But meanwhile, just wanted to give you two TWO THUMBS UP. I’m still working my way through the TOB collection, but I want to tell you how impressed I’ve been with the stories. Honestly, as much as I enjoy the TOB-centered books I’ve read in the last few years, I’ve always felt that parts of them come across as slightly heavy-handed. I look past it easily, but I always have a feeling that it wouldn’t go over with someone who’s not already accepting of TOB and Catholic teaching. This bunch of stories has surprised me in ways that I hadn’t imagined! I love that so many of them leave you open to interpreting what the main characters will decide to do, and I love, too, that the characters who are not on board with Catholic teaching are presented so thoughtfully and with such depth. And very little feels like a lecture, which (sorry to say) sometimes happens when authors try a bit too hard to get that message in. Seriously, I really am loving this book. Kindle preorders of Image and Likeness are available now. If you’d like to follow along with the last days of a novena to St. John Paul II, please do so on co-editor Erin McCole Cupp’s Instagram page. 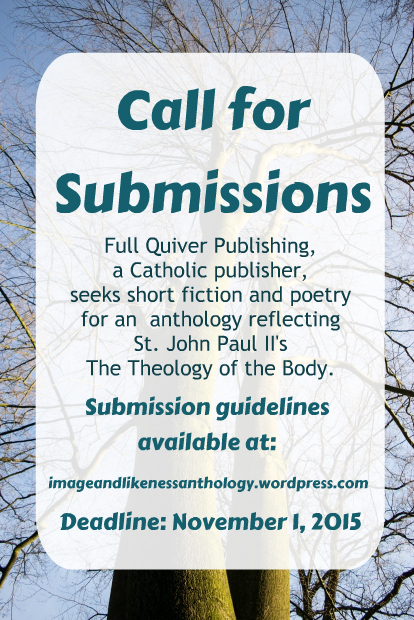 Full Quiver Publishing is creating an anthology of short fiction and poetry under the working title Image and Likeness: Short Literature Reflective of the Theology of the Body. The target publication date is October 22, 2016, the feast of St. John Paul II. Contributors will receive contributor’s copy/copies in a number commensurate with the final word count of the included contribution; additional copies will be available to contributors at reduced cost. Electronic submissions only: .DOC, .PDF, .RTF, .TXT or Google Doc. Please use double spacing. Please no fancy fonts, formatting or hyperlinks. Please keep reading to the bottom for submission method. Word count: around 7500 words for prose, 3,000 for poetry. If you can make your point in fewer, do. If you need a little more room than that to make your point, we may be able to work with you, so give it a try. Subject: Adult short fiction (sorry, no children’s or YA) and poetry reflective of St. John Paul II’s Theology of the Body. If you don’t know what that means, this may not be the project for you (however, we do encourage you to research TOB and discover its richness). Reprints considered, provided the author still retains all rights. Treatment: The intended audience for this anthology is readers who want to see the Theology of the Body illustrated positively through the literary arts. Think of your audience when considering if or how to include profanity, violence, gore, vulgarity, etc. How to Submit: In order to avoid having your manuscript lost in the spam folder, enter a submission request through this form, and an editor will be in touch with you about where to send your file. Deadline: November 1, 2015. We hope to respond to all submissions by January 15, 2016. Ready to submit your story or poem? Click here to arrange for your submission.